A lead seal of Tsar Simeon I the Great (r. 893-927 AD), ruler of the First Bulgarian Empire (632/680-1018 AD), and probably the most powerful Bulgarian leader of all time in terms of both military victories and cultural and literary achievements, has been found in his capital Veliki Preslav (Great Preslav) in today’s Northeast Bulgaria. 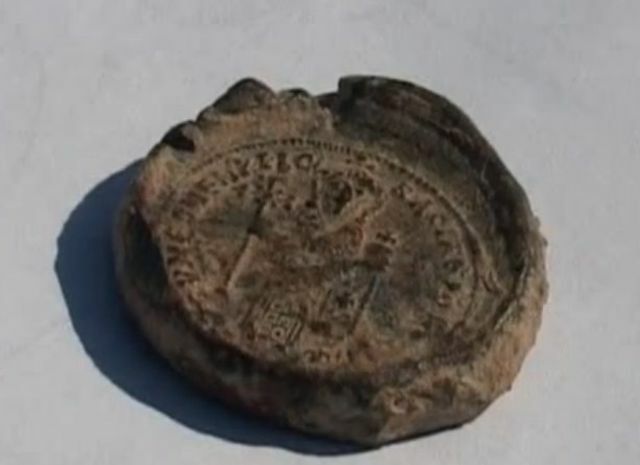 Tsar Simeon’s seal has been discovered by locals doing construction work not far from the ruins of the so called Round or Golden Church in Veliki Preslav, capital of the First Bulgarian Empire in 893-970 AD. The seal has been turned over to Bulgaria’s National Museum of History in Sofia, the Museum Director Bozhidar Dimitrov has announced in a statement, adding that the person who turned it in will receive a money award. Such finds [as seals of Bulgarian Tsars] are rare, says Dimitrov, adding that the newly discovered lead seal of Tsar Simeon I the Great will become part of the permanent collection of Bulgaria’s National Museum of History. The lead seal of Tsar Simeon features perfectly preserved depictions on both of its sides. One of them depicts the Tsar himself wearing a war helmet, and has an inscription in Greek reading, “Archon Simeon". Archon is a Greek word meaning a “lord" or a “ruler", and used as an aristocratic or ruler’s title in Ancient Greece, the Byzantine Empire, and the Bulgarian Empire. The other side of the seal depicts Christ Pantokrator (“Almighty"), a specific depiction of Jesus Christ in Eastern Orthodox iconography, and has an inscription reading, “God, Protect the Archon of the Bulgarians Simeon". With this seal, Bulgaria’s Tsar Simeon signed decrees, orders, and administrative letters, which were drafted by calligraphers; the seal certified that they indeed came from the Tsar, explains the statement of the National Museum of History in Sofia. It adds that Tsar Simeon had two different types of seals corresponding to the two different periods of his reign – before and after the Battle of Anchialos, also known as the Battle of the Achelous (Acheloos) River on August 20, 917 AD, one of the largest battles in medieval history, in which Simeon’s forces wiped out almost the entire Byzantine army of some 62,000 troops. After his great victory at Anchialos, Knyaz Simeon assumed the title of Tsar, the Slavic-Bulgarian form of Caesar, i.e. Emperor, and more specifically the titles “Basileus of All Bulgarians and Greeks" (“Basileus" being the title of the Byzantine Emperors) and “Autocrat of All Bulgarians and Romans" (referring to the fact that the Byzantine Empire was technically a continuation of the Roman Empire). Thus, the first type of seals used by Tsar Simeon date from the period between 893 and 917 AD, when his signed his decrees as “Archon" of the Bulgarians, while the second type of seals date from the last decade of his reign, between 917 and 927 AD, when he signed as “Basileus (i.e. Emperor) of Bulgarians and Romans". The newly presented lead seal is the third seal of the powerful medieval Bulgarian Emperor to be discovered in the last five years. 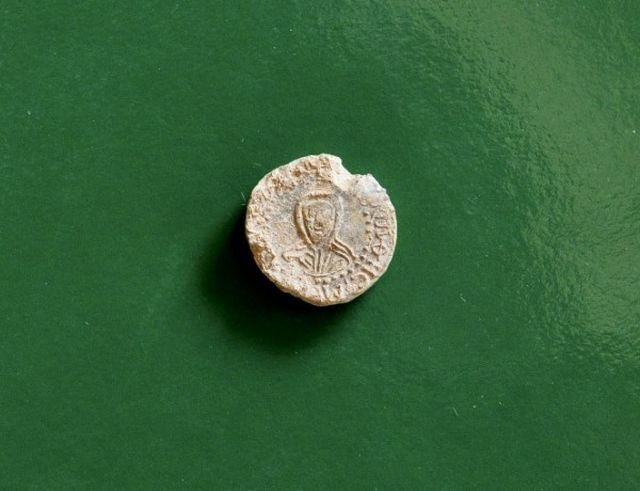 Two lead seals of Bulgaria’s Tsar Simeon I the Great were discovered by Bulgarian archaeologists during archaeological excavations in Veliki Preslav in 2008 and in 2010, respectively. In 2008, an archaeological team led by Assoc. Prof. Dr. Margarita Vaklinova and Assoc. 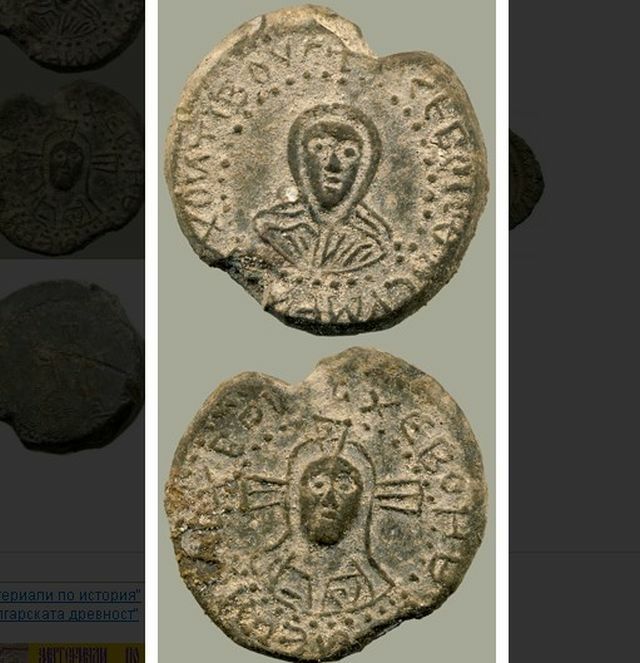 Prof. Dr. Irina Shtereva discovered a lead seal of Tsar Simeon from his earlier period (893-917 AD) with depictions of Jesus Christ and the Virgin Mary, and an inscription reading, “Simeon, Archon of the Bulgarians". In 2010, the team led by Assoc. Prof. Dr. Irina Shtereva discovered a lead seal of Tsar Simeon from his later period (917-927 AD), with a depiction of Tsar Simeon and an inscription, reading “Simeon in Christ Basileus of the Romans" on one side, and a depiction of Jesus Christ, and an inscription reading, “To the Victor Simeon, [For] Many Years", on the other. Tsar Simeon I the Great was the ruler of the First Bulgarian Empire (632/680-1018 AD) in 893-927 AD. He was probably the most powerful Bulgarian leader of all time in his capacity as both a military commander and a patron of spiritual life, culture, and literature. During his reign Bulgaria probably saw its greatest territorial expansion (although some scholars argue that its territory was slightly greater during the reign of Tsar Samuil (r. 977/997-1014 AD)) coving all of Southeast Europe and much of Central Europe (estimates range around 650,000 sq. km. ), including all or parts of modern-day Bulgaria, Romania, Greece, Turkey, Serbia, Albania, the Republic of Macedonia, Kosovo, Montenegro, Bosnia, Hungary, Moldova, and Ukraine, bordering on the three seas – the Black Sea, the Aegean, and the Adriatic. What is deemed more important, however, is that his reign saw the so called Golden Age of Old Bulgarian culture and literature in the Old Bulgarian language (also known today as Church Slavonic), with its cultural influence later spreading to other Slavic peoples in South and Eastern Europe. 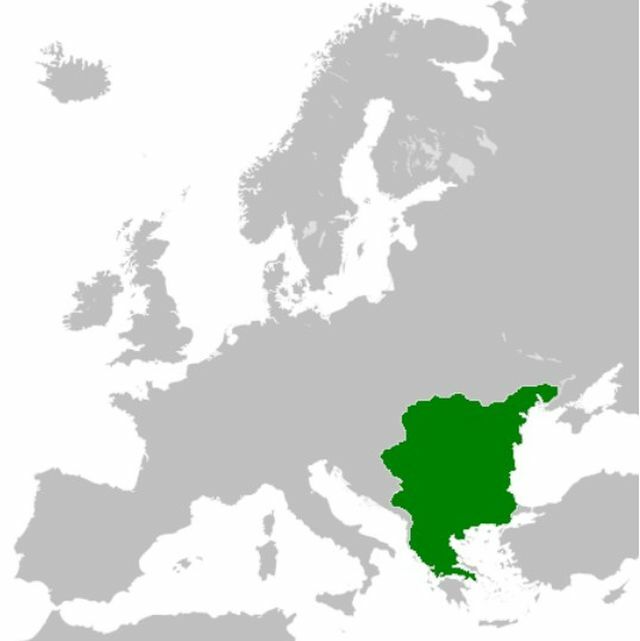 The future Tsar Simeon was born in 864 or 865 AD, at about the time the First Bulgarian Empire adopt Christianity as its official and only religion. He was the third son of St. Knyaz Boris I (r. 852-889; 893 AD), and since he was intended to become head of the Bulgarian Orthodox Church, his father sent him to be educated at the Imperial University of Constantinople, the capital of the Byzantine Empire, also known as the University of the Palace Hall of Magnaura. Simeon studied there between ca. 878 and ca. 888 AD, and because of his erudition, Byzantine chroniclers to refer to him later as “the half-Greek". After his return to Bulgaria, Simeon started participating in the translation of religious works from Greek into Bulgarian at the Preslav Literary School. However, Knyaz Vladimir Rasate (r. 889-893 AD), Knyaz Boris I’s first-born son and successor to the throne, attempted to abandon the recently introduce Christianity and restore paganism. This led the aged Knyaz Boris to lead a de facto coup d’etat removing Vladimir from the throne, and making Simeon the Knyaz (King) of Bulgaria during the Preslav Council (Assembly) of 893 AD which also decided to move the capital of the First Bulgarian Empire from Pliska to Veliki Preslav (Great Preslav) in order to do away with any pagan traditions. The young Knyaz Simeon’s reign did not begin smoothly but with what has been described as the first commercial war in medieval Europe in 894 AD, after Byzantine Emperor Leo VI the Wise moved the marketplace of Bulgarian merchants from the Byzantine capital Constantinople to the city of Thessaloniki. In the ensuing military actions, Bulgaria’s forces defeated the Byzantine troops that met them, which was made easier by the fact that the main units of Byzantium were fighting the Arabs in Asia Minor. The notorious Byzantine diplomacy, however, was able to instigate a “backstabbing" attack on Bulgaria from the north by the Magyars who were ferried by the Byzantine Navy across the Danube near the river’s delta. After initial losses and withstanding a siege in the strong Bulgarian fortress of Drastar (today’s Silistra known as Durostorum in Roman times) on the Danube, together with his allies the Pechenegs, the Bulgarian ruler routed the Magyars in the extremely fierce Battle of Southern Buh (in today’s Ukraine) in 895 AD which eventually led their tribes to retreat to the west and settle in the region of Pannonia essentially founding today’s Hungary. What followed was a constant military conflict between Bulgaria and Byzantium. The Byzantine army was defeated by the Bulgarian forces in the Battle of Bulgarophygon (today’s Babaeski in Turkey) in 896 AD, who then besieged Constantinople. The war ended with a peace treaty after the Byzantine Empire sued for peace and agreed to pay annual tribute to Bulgaria, and ceded parts of the region of Thrace. After the Arabs plundered the city of Thessaloniki, in 904 AD, Leo VI ceded all Slav-populated territories in today’s Northern Greece, the Republic of Macedonia, and Albania in order to dissuade Simeon from capturing Thessaloniki and populating it with Slavs, as the Bulgarian ruler intended. 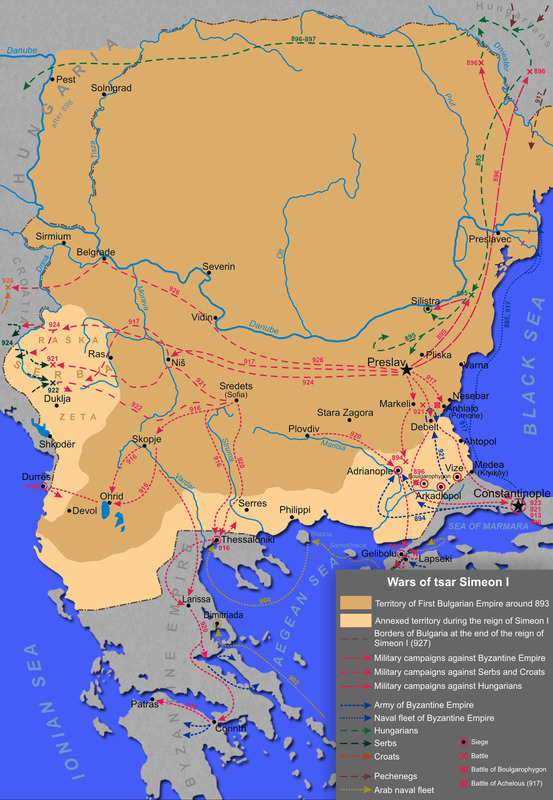 In the meantime, Knyaz Simeon included Serbia as a vassal in the First Bulgarian Empire. The peace generally held until 912 AD when Byzantine Emperor Leo VI the Wise died which led to a succession crisis and strife for the Byzantine throne. After a Byzantine regent refuse to pay the annual tribute to Bulgaria, the troops of the First Bulgarian Empire besieged Constantinople again in 913 AD. In the ensuing negotiations, the Byzantine tribute was paid, and Simeon was promised that the minor Emperor Constantine VII would marry one of his daughters technically allowing him to lay a claim to the throne in Constantinople. The following year, however, the deal was broken by Empress Zoe, Emperor Constantine’s mother, leading to a resumption of the Bulgarian-Byzantine war in which Simeon’s forces captured the city of Adrianople (today’s Edirne in Turkey). A major clash of the two empires occurred in the summer of 917 AD, when the Byzantines first tried to organize a wide-ranging international coalition against the Bulgarian Empire, and marched against Bulgaria with a huge army of their own led by Byzantine general Leo Phocas (Phokas) the Elder, and a fleet led by Romanus Lecapenus (Romanos Lekapenos), later Byzantine Emperor (r. 920-944 AD). On August 20, 917 AD, in the Battle of Anchialos, also known as the Battle of the Achelous (Acheloos) River near the Black Sea coast, which was one of the largest battles in medieval history, the Bulgarian forces annihilated almost the entire Byzantine army in which only about 2,000 of the total of some 62,000 troops survived. The Bulgarian Emperor personally led a cavalry charge, and his white horse was killed at the height of the battle. Byzantine chronicler Leo the Deacon, who visited the site of the Battle of Anchialos 75 years later, wrote that “piles of bones can still be seen today at the river Acheloos, where the fleeing army of the Byzantines was then infamously slain". The Byzantine defeat at the Battle of the Achelous (Acheloos) River was followed by another Bulgarian military victory in the Battle of Katasyrtai. After his great victory at Anchialos, Knyaz Simeon assumed the title of Tsar, the Slavic-Bulgarian form of Caesar, i.e. Emperor, and more specifically the titles “Basileus of All Bulgarians and Greeks" (“Basileus" being the title of the Byzantine Emperors) and “Autocrat of All Bulgarians and Romans" (referring to the fact that the Byzantine Empire was technically a continuation of the Roman Empire), and began to strive ever more stubbornly to sit on the throne in Constantinople; the head of the Bulgarian Orthodox Church was promoted from Archbishop to Patriarch. The imperial title of the Bulgarian Tsar and the Patriarchate status of the Bulgarian Church, however, were only formally recognized by Byzantium after Tsar Simeon’s death, in 927 AD, to his heir, St. Tsar Petar I (r. 927-969 AD). In the last decade of his reign, Tsar Simeon waged even more wars in pursuit of his dream of sitting on the Byzantine throne, which, however, moved further away after in 920 AD Byzantine admiral Romanus Lecapenus (Romanos Lekapenos) removed Empress Zoe as a regent, betrothed his daughter Helene Lekapene to the underage Emperor Constantine VII, and became a Co-Emperor, which is what Bulgaria’s Tsar Simeon had aspired to do. Tsar Simeon waged wars on Byzantium even more fiercely, besieged Constantinople a couple of more times, launched a campaign down south all the way to the Isthmus of Corinth, crushed Serbian revolts and annexed all of Serbia, and even planned a joint attack on Constantinople together with Fatimid Caliph of Egypt, Ubayd Allah al-Mahdi Billah, who was supposed to contribute the Egyptian Navy; the plan failed only because the Byzantines managed to capture the Bulgarian and Egyptian envoys on their way back from Egypt. Of all his victorious wars, Tsar Simeon’s last one – against Croatia in 926 AD – was unsuccessful. He died of a heart failure in his imperial palace in Veliki Preslav on May 27, 927 AD. Byzantine chronicles attribute his death to a magic caused by Byzantine Emperor’s Romanus Lecapenus decapitation of a statue of Simeon held in Constantinople. While Tsar Simoen’s great territorial expansion and numerous wars, albeit victorious, are a controversial heritage because they are known to have exhausted the resources and the population of the Bulgarian Empire, his undisputedly most important heritage is the so called Golden Age – the thriving and unique Old Bulgarian culture and literature with the use of the Bulgarian (Cyrillic) alphabet which established Bulgaria as the spiritual center of the Slavic peoples. It first started under Simeon’s father, St. Knyaz Boris I Mihail in 886 AD with the arrival of two of the main disciples of St. Cyril and St. Methodius – St. Kliment Ohridskis (Clement of Ohrid) and St. Naum Preslavski (Naum of Preslav) – and the foundation of the Orhid Literary School and the Preslav Literary School. It was in this period that the first Slavic-Bulgarian alphabet, the Glagolitic, was transformed into the second Bulgarian alphabet used today by some 300 million people in Europe and Asia, which is also known international as the Cyrillic. Under Tsar Simeon’s patronage, the Old Bulgarian medieval scholars were very active in translating Christian texts into Old Bulgarian, essentially the Slavic proto-language, including the Bible, and the works of John Chrysostom, Basil of Caesarea, Cyril of Alexandria, Gregory of Nazianzus, Athanasius of Alexandria, and the historical chronicles of John Malalas and George Hamartolus. They also authored a number of original texts in Old Bulgarian, including Yoan Ekzarh’s (John Exarch) Six Days (Shestodnev), Konstantin Preslavski’s (Constantine of Preslav) Alphabetical Prayer and Proclamation of the Holy Gospels, and On Account of Letters by Chernorizets Hrabar (“The Brave Monk", which might have been a pseudonym for Tsar Simeon himself). Tsar Simeon’s capital Veliki Preslav was built up to rival “the Second Rome", Constantinople, with an impressive imperial palace, and dozens of churches and monasteries, including the so called Round or Golden Church, which is expected to be restored in present-day Bulgaria as a cultural tourism site. Because of these achievements, Tsar Simeon was named “the Great" by later Bulgarian historians. In the words of French historian Alfred Nicolas Rambaud (1842-1905), “Simeon was the Bulgarian Charlemagne, but he was better educated than our Charles the Great and much greater than him, for he laid down the foundations of literature that belonged to the people."